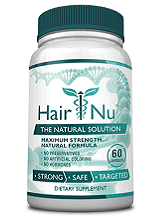 This is a review of HairNu hair growth supplement. It is claimed by the manufacturer to fight hair loss by treating the core causes of hair loss and growing of new, healthy hair. It stimulates the scalp and provides nutrients to hair follicles, effectively improving the health and look of your hair and regulates the balance of hormones responsible for hair loss. The B complex vitamins are crucial for your health and the health of your hair: vitamin B2 is responsible for nutrition of the follicle, pantothenic acid (B5) adds elasticity to the hair strand and prevents hair loss, lack of B6 is associated with an onset of dandruff and B12 is vital for a number of different metabolic functions throughout the body. The absorption rate and balance of minerals, such as copper, iron, selenium and zinc are regulated by silica; their imbalance leads to malfunction of the body and can lead to having weak, unhealthy hair and even hair loss. Other ingredients include a gelatinous capsule, microcrystalline cellulose, magnesium stearate and silicon dioxide. Use of gelatin makes this product unsuitable for vegans and those with a excluding dietary plan. The recommended daily dose of this supplement is 2 capsules with meals, one in the morning and one in the evening. One bottle contains 30 capsules, so you need two of them to last you a full month of continuous use. The manufacturer is offering a number of discounted packages depending on the severity of you problems, some of which can save you up to 61%, or $220. One bottle will cost you $49.95, you can get two for $69.90, three for $95.85, four for $111.80, five for $124.75 and lastly six for $139.80. The company making HairNu has not specified the time frame needed for the product to work, as the severity of hair loss varies from case to case. The all natural ingredients making this product ensure it is safe for long term use. But make sure to confirm with your doctor before taking this one or any other dietary supplement. The manufacturer making this supplements is very confident about their products and offers a full money back guarantee. The return must be made within 60 days from the date of purchase and importantly, all of the bottles must be returned, whether they are full or empty. If you fail to return all the bottles, you risk receiving a partial refund. Judging from the testimonials on the product website, people seem very pleased with this supplement and the amount of relief it has brought them. Hair loss is a wide-spread issue that affects both men and women. Whether you are suffering from irritated scalp, weak and unhealthy hair or even complete hair loss, HairNu is a product that addresses those issues in great detail and brings much needed treatment and relief.